Incorrectly prepared or selected welder tips are a common culprit in faulty squeeze-type resistance spot welds, Society of Collision Repair Specialists panelists cautioned in an new video. The advice on tips was one of the major takeaways in Part 2 of a free SCRS educational video trilogy on spot welding. That film and Part 3 debuted Nov. 22 and followed Part 1’s release in September. Sparks might fly from tips which aren’t perpendicular to the substrate surface, Chess said. In squeeze-type resistance spot welding, “when sparks fly, that weld is no good,” said fellow panelist and SCRS board member Dave Gruskos (Reliable Automotive Equipment). Tips worn in just one area can allow air into the weld, increasing resistance and creating heat, according to Chess. “That heat’s going to create blowouts of your welds,” he said. With STRSW welders, the “biggest problem is the tips,” Chess said. Panelist Barry Dorn (Dorn’s Body & Paint), a former SCRS chairman, noted that managers might not often see the tips’ condition and asked how frequently they should be replaced. “You look for the tips being clean,” Gruskos said. Good tips nowadays might be made from a high enough quality material that a scuff pad would be enough to clean them, he said. Some modern welders even keep track of your spot welds “and force you to clean your tips” past a certain threshold, he said. Kye Yeung (European Motor Car Works), now SCRS’ chairman, said that the proper training is important so that techs know when the tips need to be dressed or replaced. “I see most of the equipment out there is in average to poor condition,” Chess said, describing going out and looking at tips and consumable drawers. “It’s like your car,” Chess said — it’s an expensive piece of equipment that needs to be upgraded and maintained. Of course, sometimes shops just don’t know what’s right and wrong, which just goes back to a need for training, according to Chess. 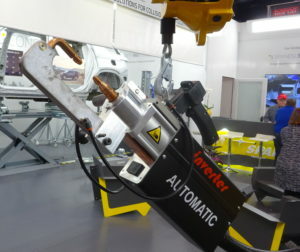 Welder manufacturers often have good training programs, and I-CAR has a “very good class” on squeeze-type resistance spot welding as well, he said. The course now demands a spot welder so that students can see the actual procedures. “He puts the wrong tips on the welder” to accommodate his own preferences — not those of the manufacturer, Gruskos said. “You have to keep the welder the way it was designed to work,” Gruskos said.